This may be your first algebra lesson. In case you are rather uncomfortable with algebra, you may want to first go through Basic Algebra - An Introduction - that would give you a good foundation before this lesson. The common transposition method is to do the same thing (mathematically) to both sides of the equation, with the aim of bringing like terms together and isolating the variable (or the unknown quantity). Now, looking at the LS we have 3x. So we need to divide it by 3 to isolate x, and we need to do the same to the RS. So, our answer x = 9 is correct. That's the algebra lesson on transposition. Now, you are ready to review some examples to further develop your understanding of transposition. The following are some examples of Algebra Transposition. Scroll down the page for more examples and step by step solutions. What is transposition? What is it used for? How to transpose (or rearrange) equations? 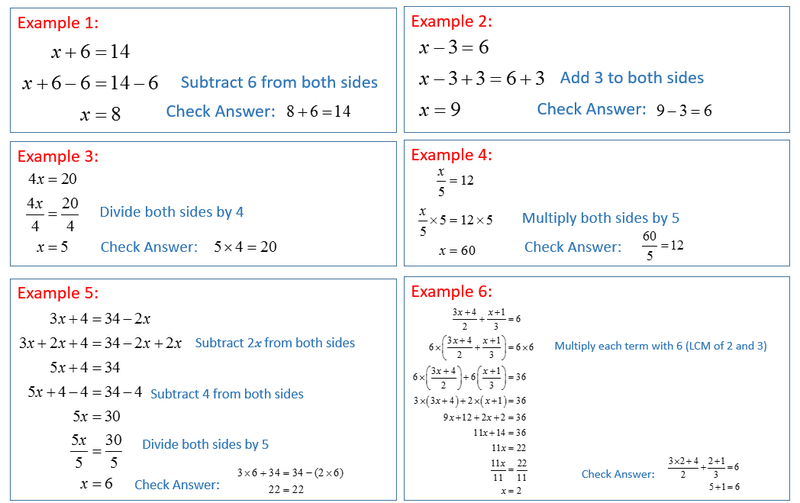 Having completed the practice questions, you are now ready for other algebra lessons, like Substitution.